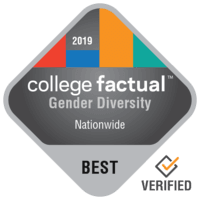 Cincinnati, Ohio – College Factual has released its 2019 rankings for gender diversity. University of Cincinnati – Main Campus did very well in these rankings that recognize colleges for diversity in gender. The university earned this recognition due to its commitment to supporting both men and women. In particular, of all undergraduates on campus 50.3% are male and 49.7% are female. University of Cincinnati – Main Campus is ranked #56 out of 2,486 colleges and universities analyzed for gender diversity. This puts them in the top 5% of all schools in the country. See the full nationwide diversity rankings. University of Cincinnati – Main Campus is ranked #3 out of 113 colleges in the state of Ohio for gender diversity. This puts Cincinnati in the top 5% of all colleges in the state. Read more about diversity at Cincinnati. See the full rankings for diversity in Ohio. To rank colleges based on diversity, College Factual analyzed the age, gender, race, and location of origin of enrolled students. The greater the variety, the higher a college will rank. Read more about the diversity ranking. University of Cincinnati – Main Campus is located in Cincinnati, Ohio in a city setting. Cincinnati serves approximately 25,800 undergraduate students from across the country. The school has a student to faculty ratio of 17 to 1. Cincinnati is a top school for gender diversity according to @CollegeFactual. Learn more about the components of diversity at Cincinnati, including ethnic, gender, and age diversity. College Factual, located in Troy, New York, is the leading source of data analytics and insights on college outcomes. College Factual provides in-depth coverage for over 2,500 colleges and universities and over 350 college majors. These insights are available to students from over 200 countries interested in pursuing accredited college degree programs in the United States. Get notified when similar news about University of Cincinnati - Main Campus happens.